Karlyachi peeth perun bhaji recipe - Bitter gourd sabzi - This is a Maharashtrian style karlyachi bhaji made with bitter gourds and gram flour. Eating karlyachi bhaji without adding jaggery or sugar is beneficial for health. 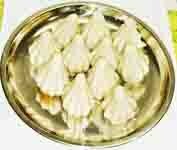 Some people do not discard the seeds and use them as it is in the bhaji for more medicinal benefits. But I made this karlyachi peeth perun bhaji using jaggery and tamarind for taste which reduces the bitterness and increases the taste. While preparing this karlaychi peeth perun bhaji, I discarded the seeds and lightly scraped out the outer skin. You can make this bhaji along with seeds. 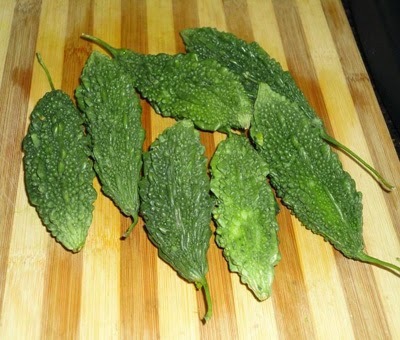 Bitter gourd is a popular vegetable, famous for its medicinal benefits and it is great for diabetes. It is very low in calories and high in valuable nutrients. bitter gourd is a rich source of vitamin B1, B2, B3, vitamin C, magnesium, zinc, phosphorous and manganese. It has an ample supply of antioxidants and dietary fibers which help flush out the toxins. 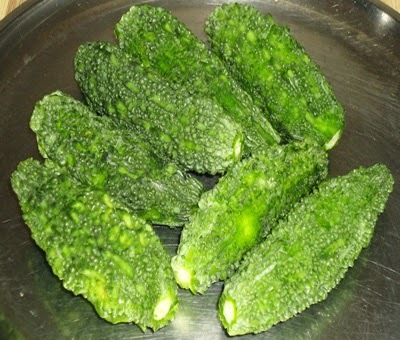 Bitter gourd contains good nutrition like polypeptide-P ( blood sugar lowering compound ) which helps in lower the blood sugar level. The consumption of bitter gourd juice on empty stomach in the morning, reduces the blood sugar level in people who have diabetes. To be on the safer side, this juice therapy should be followed under the medical care of physician ( A licensed medical practitioner). Wash the bitter gourds and pat dry with a clean kitchen towel. Slightly scrape the outer skin, cut the end parts and slit them into half in the middle. Remove the seeds with the help of a spoon or knife and cut them into medium sized pieces. You can keep the seeds if you like it. Heat the oil in a pan and add mustard seeds to it. When mustard seeds spluttering, add the cumin seeds and allow to crackle. Then add the curry leaves and saute for 30 seconds. Add the chopped bitter gourds, little bit of salt and give a nice stir. Cook covered on low flame till the bitter gourds becomes soft. Stir in between. Once the bitter gourds turns soft, add the turmeric powder, chilly powder and kala masala or garam masala one by one. Saute for a minute and add the tamarind pulp. Mix well till all the ingredients combine. Dissolve the jaggery in 1 table spoon of water and add. Cook covered for 2-3 minutes or till the raw smell disappears. Then sprinkle the besan, salt and stir continuously for 5 minutes or the besan turns soft and form a coat with the bitter gourds. You can add more besan if you like it. Serve the karlyachi peeth perun bhaji hot with rotis, chapatis and rice with curry as a side dish. 1. Wash the bitter gourds and pat dry with a clean kitchen towel. 2. Slightly scrape the outer skin, cut the end parts and slit them into half in the middle. 3. Remove the seeds with the help of a spoon or knife and cut them into medium sized pieces. You can keep the seeds if you like it. 4. Heat the oil in a pan and add mustard seeds to it. When mustard seeds spluttering, add the cumin seeds and allow to crackle. Then add the curry leaves and saute for 30 seconds. Add the chopped bitter gourds, little bit of salt and give a nice stir. 5. Cook covered on low flame till the bitter gourds becomes soft. Stir in between. 6. Once the bitter gourds turns soft, add the turmeric powder, chilly powder and kala masala or garam masala one by one. Saute for a minute and add the tamarind pulp. 7. Mix well till all the ingredients combine. 8. Dissolve the jaggery in 1 table spoon of water and add. Cook covered for 2-3 minutes or till the raw smell disappears. 9. Then sprinkle the besan, salt and stir continuously for 5 minutes or the besan turns soft and form a coat with the bitter gourds. you can add more besan if you like it. 10. Serve the karlyachi peeth perun bhaji hot with rotis, chapatis and rice with curry as a side dish. Love pith perun karlyachi bhaji.........looks yummm!!! 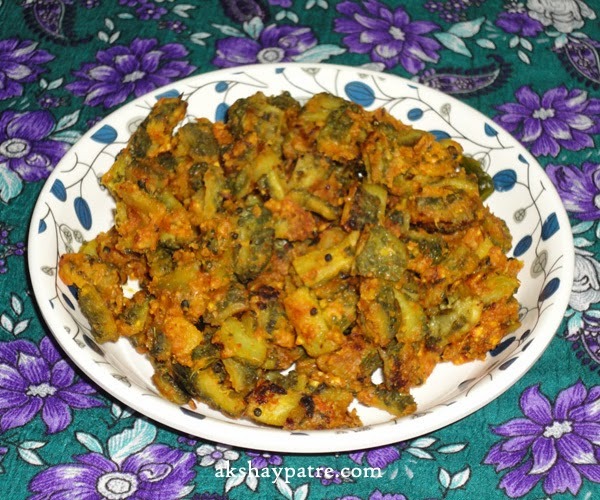 Nice recipe with karela, looks delicious.